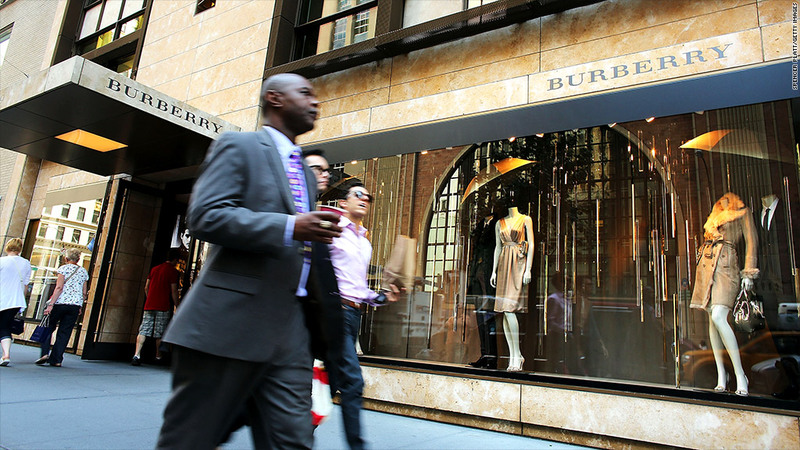 Burberry's stores experienced double-digit sales growth in China and the Americas in the first quarter of 2013. Burberry has done it again. The luxury retailer continues to shine in its home market and abroad, reporting a 21% increase in global first quarter sales. Its stores in China turned in the strongest growth. The latest figures impressed investors and Burberry shares gained as much as 5%. The company says its results were driven by the "exceptional performance" of its spring and summer fashion line. London-listed Burberry (BBRYF) is well-known in the fashion industry for appealing to wealthy Chinese customers, and the latest earnings report confirms that it's still making headway in the country. Related: Burberry chief is the top paid CEO in the U.K.
"Of all the luxury brands that set up in China, Burberry seems to have captured the wealthy Chinese audience more successfully than any other luxury brand," said Oliver Williams, a senior analyst at WealthInsight, who specializes in luxury markets in Asia. But China is not the only market where Burberry is reporting strong growth. The fashion brand averaged double-digit sales growth in stores across the Americas and also managed to grow its business at stores in Europe, the Middle East, India and Africa. Consumers value Burberry's modern edge, maintained through its fashion designs, online social media outreach and other initiatives. "The launch of its innovative non-commercial Burberry Acoustic music project for emerging artists has maintained as much of that cool edginess as its celebrity-studded ad campaigns," said Ivailo Jordanov, CEO of shopping website Styloko.com.